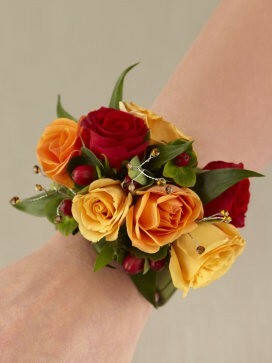 A stunning sunshine inspired wrist corsage. A sunshine inspired wrist full of roses! This is indeed a energy packed, vibrant and colourful display of sunshine roses set to premium perfection this truly is an adorable, unusual wrist corsage perfect for any special occasion or big day. 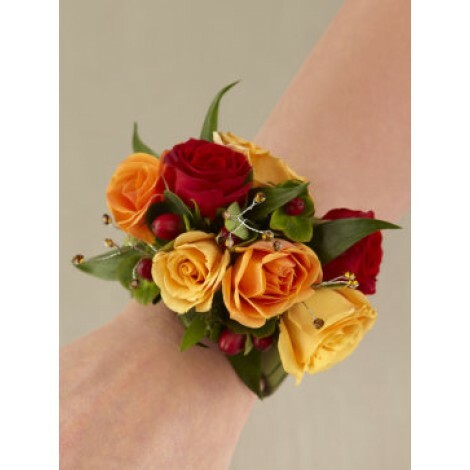 This adorable floral wrist accessory is comprised of; Red orange and yellow spray roses, red hypericum berries, lush greens and topaz rhinestone pics. All perfectly arranged and set onto a wristlet giving a breathtaking, colourful, vibrant look.